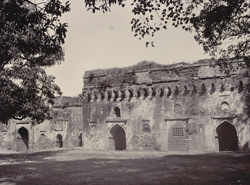 Photograph of the Natnagara ruins at Dhar, Madhya Pradesh, taken by an unknown photographer in c.1902. The Malwa region of central India was a stronghold of the Rajput Paramaras from the 9th to the 13th century, with their capital at Dhar. They were famed for their patronage of literature. In 1305 Dhar was absorbed into the Delhi Sultanate by Alauddin Khalji. The region began to develop a distinct architectural style after Dilawar Khan Ghuri broke away from Delhi in 1401, becoming the first Sultan of the independent province of Malwa. He was succeeded by his son Hoshang Shah (ruled 1405–35), who transferred the capital to Mandu. In 1436 Mahmud Shah Khalji I (ruled 1436–69) established a new dynasty in Malwa that lasted until 1531, when the region was annexed to the Sultanate of Gujarat. Dhar has a legacy of architecture often hybridising Hindu and Muslim elements.